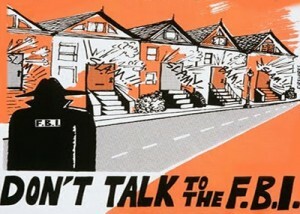 Recently, persons working for the United States Federal Bureau of Investigation and the Joint Terrorism Task Force have contacted multiple DGR members by phone and in-person visits to their homes. These agents attempted to get members to talk about their involvement with DGR, have asked for permission to enter members’ homes, and contacted members’ families. DGR strategy and community rests upon a diligent adherence to security culture – a set of principles and behavior norms meant to help increase the safety of resistance communities in the face of state repression. All members are required to review and agree to our guidelines upon requesting membership, and we routinely hold org-wide refresher calls to remind everyone. We understand that while these guidelines can help increase our safety from state repression, unfortunately we cannot ever guarantee complete protection. DGR is strictly an aboveground organization. As per our code of conduct, our members do not engage in underground or extra-legal tactics, and any member who violates our code of conduct forfeits their DGR membership. We advocate for a strategy that can effectively address the converging threats to the living world. Such a strategy is a threat to the ruling system, and state repression should be expected. DGR is dedicated to remaining effective while also doing all we can to increase member safety. We will not be intimidated into compromising our work, and we remain committed to amplifying the voice of resistance against injustice and ecocide. Read our security culture guidelines. “I will not”, I replied. Then I asked for their cards. The male passed me a card from the Criminal Intelligence Unit of the Bellingham Police Department. It identified him as Detective Al Jensen. The female said she did not have a card, so I asked for her name so I could write it on Jensen’s card. “Brenda”, she said. I asked “Is that all of it” and she replied “Yes”. Jensen jocularly mentioned that we knew each other from the Occupy Movement/Camp and Train Blockade, attempting to coax up conversation. I did not take the bait. They gathered themselves and left. The Law Offices of Lawrence A. Hildes at (360) 715-9788 wants to hear from anyone questioned or visited during this visitation sweep. This includes those DGR members who have been or become targeted. It is expected that this state security team was on a round of visitations/questionings in Bellingham today. If you know of someone they contacted, please get this notice to those people. No one should hide an encounter like this with state security. No one should fear backlash as a consequence of effective activism. Activist Attorneys wish to hear from you if you have been questioned or visited by state security seeking dirt on other activists. Repression at Home DGR activity & statements, Deep Green Resistance, FBI, Security culture. permalink.